This faith-based ring is a reminder of what's important in life: to love and be loved, unconditionally. 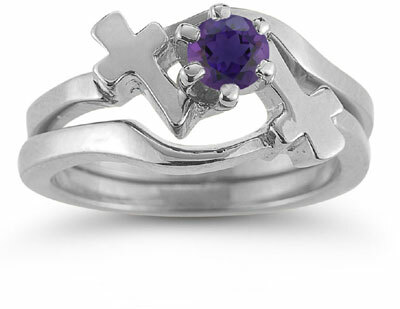 The Amethyst Cross Wedding Ring Bridal Set creates a unique landscape of white gold with a brilliant amethyst stone. The ring's careful construction draws on the idea of a jewel situated at the top of a mountain built on faith and trust. The ring features two 14k white gold bands, each 2mm wide and joined at the back. The bands have a flowing movement to them that lead the eye to each of the solid gold crosses that flank the stone on either side of the setting. The design is balanced by the inverted crosses, with one anchored at the top of the ring and the other at the bottom. The round-cut amethyst stone (5mm) takes center stage, appearing at times to be glowing from within. Like reading a story board in a piece of jewelry, this ring tells a tale of love, belief, and devotion. The white gold shines in the light, offering additional reflection onto the royal blue and purple gem. We guarantee our Amethyst Cross Wedding Ring Bridal Set, 14K White Gold to be high quality, authentic jewelry, as described above.